Due to Lyndall's failing health our cruising is limited in time away from our berth but the quality of the anchorages around Townsville is great. In cruising terms this winter has been a quiet one. Lyndall's health problem now requires 2-weekly visits to hospital for a blood transfusion. Illywhacker is in great shape, ready to go but paradoxically, we aren't. 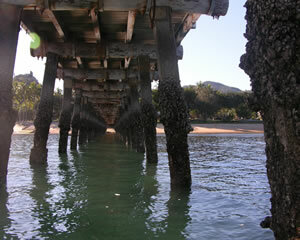 The best we can do is 3 or 4 day trips max to nearby Magnetic Island. 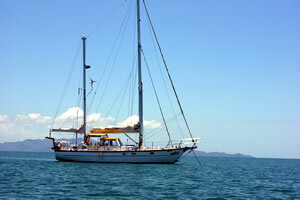 But it is a great sail out there on the prevailng SE winds and "Maggie"has some nice anchorages. 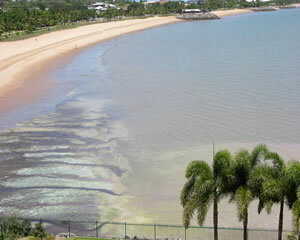 The topography of the coastline to the north and south of Townsville is flat. 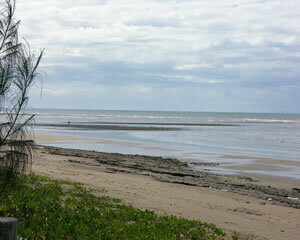 This gives rise to large expanses of exposed sand/mud at low tide and mostly results in little or no sandy beach. The surrounding countryside is in some places barely a few meters above high tide levels - a cause for some concern in this era of global warming. Stronger cyclones with higher surge levels are now predicted and many new "beachside" housing developments would not survive the 7 to 8 meter surges predicted. 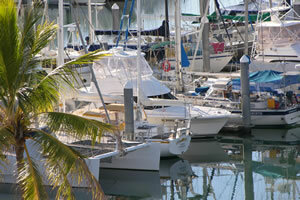 The same applies to our marina too where an up-market housing development is now on the go. A cyclone arriving at high tide with a high surge level would have us all "up on the hard". To avoid this catastrophe, smart skippers sail to the protected waters inside Hinchinbrook Island some 60nm north of Townsville and head deep into the mangroves. Others check their insurance. Illywhacker is unique - being homebuilt and packed with equipment - she could never be replaced so we hope we will be able to implement the right strategy to manage and survive a direct hit. We are lucky that day-to-day weather in the tropics is benign relative to southern parts of Australia since we are in the Tradewind belt. This usually ensures constant, predictable wind strengths and sunny skies. Cyclones occur in Summer on the tropical coasts of Australia but are usually confined to a very narrow belt - you would have to be unlucky to get clobbered! However, we just missed a hit last year by cyclone "Larry" and the Barrier Reef is suffering increased water temperatures which is causing coral bleaching. These signs suggest that things are changing but for us this is still a comfortable place to be. 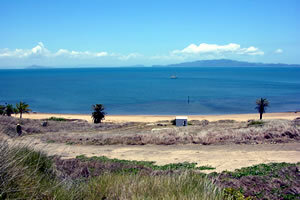 The nearest bay to Townsville, Picnic is best suited as an anchorage in northerly winds. There is, typically for the island, a substantial sandy beach, a grassy park and interesting walks around the smooth boulders along the adjacent shoreline. Picnic is accessible by road so shopping is possible during longer stays. We enjoy sailing in October, November and early December. 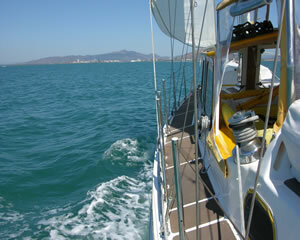 By that time the northerlies have arrived and the winds are easy, 15 - 20 kts and the seas smooth. many of the cruisers from south (which used to include us) have taken the opportunity provided by the favourable winds and left us to quiet, calm anchorages. Weather patterns at this time usually offer NE/SE then periods of NW. We took the opportunity one weekend and headed for Cape Cleveland, a rather exposed headland that offers moderate protection from the SE. 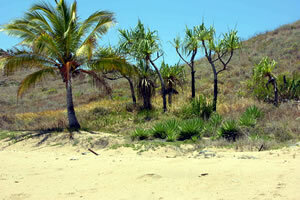 It is a remote spot, dry with low shrubs that require little moisture. There are plans underay though to modify the old lighthouse there into a low-key, water-access only resort. We anchored 100m offshore in 3m depth for a few hours over lunch before a great sail at 7 kts over smooth waters to the more protected Horseshoe Bay on Magnetic Island. 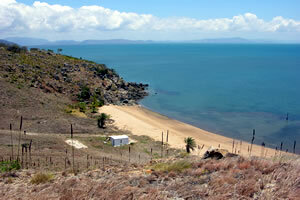 From Cape Cleveland towards Townsville Not much shade at the beach!